This month's theme for our Creation Station Blog Hop is August in my Neighborhood. What is that exactly? Well, it's what each of us on the design team celebrate during the month of August where we live. Since we live all around the world, there's a variety of events being celebrated this month! In my case, I wanted to highlight the celebration of all the county and state fairs we attend this month. There's about five of them sprinkled around different regions of our state that we like to try and visit each year. Our local county fair just finished and Jack and I did well in the home arts bringing home a total of four First Place Blue Ribbons and two Second Place Ribbons. We took about 7 calves and heifers to the fair and they all did pretty well showing. About a ten ribbons in all with one being Reserve Grand Junior Champion. As a farm family, how could we not celebrate all the wonderful fairs that highlight so many wonderful animals! 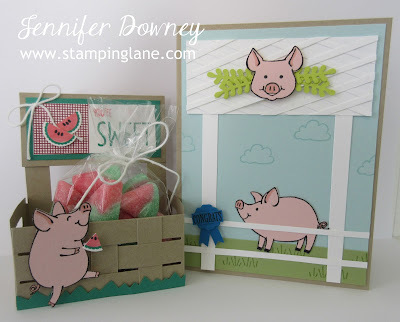 I was tickled pink when I saw the new This Little Piggy stamp set! We had pigs growing up and I would have to help dad with them all the time. 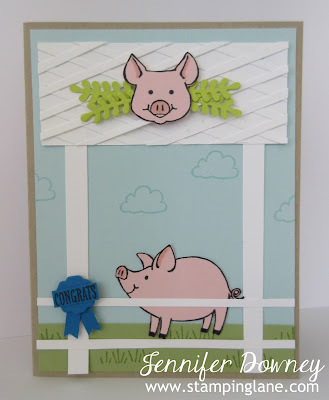 Up first I thought I would make a cute card showing off the Blue Ribbon winning pig and his display stall. If you've ever been to a county fair, families put in a lot of effort to put up displays where there animals are housed to make their space feel more homey and welcoming to the public. I thought I would do a little lattice work at the top, it's not hard just a little tedious. Then of course there is always the variety of good food at the fairs. I made up this little treat box to mimic a fair stand using our fabulous Wood Crate Framelit. To continue on with the lattice theme a little, I weaved in strips of Crumb Cake card stock on the front and back. Doesn't this little piggy look as a happy as a lark? He got his slice of watermelon and off he's going to enjoy the fair. 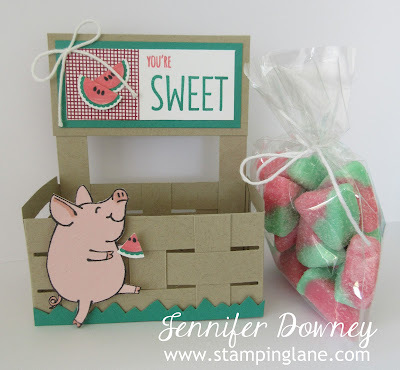 Here is what the little treat box looks like without the watermelon candy slices in it. 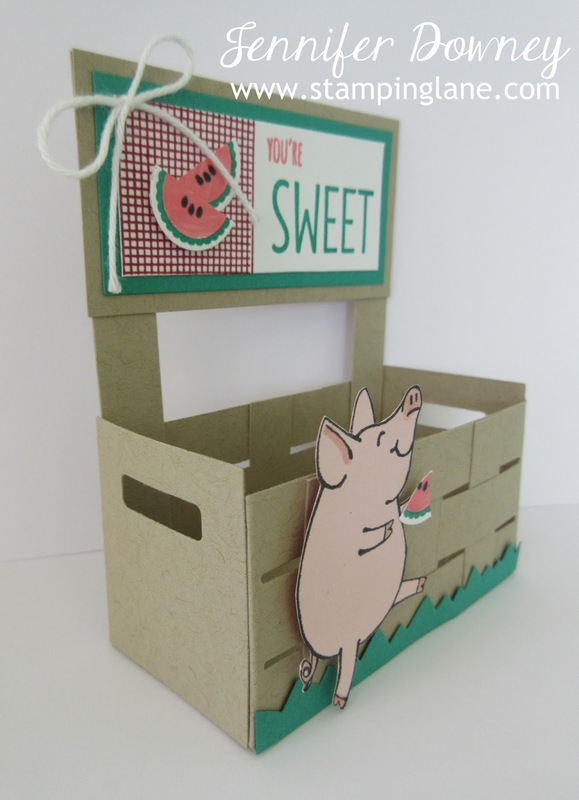 Like the card above, I added a display stand to advertise the watermelon treats. Isn't it just so stinkin' cute?! 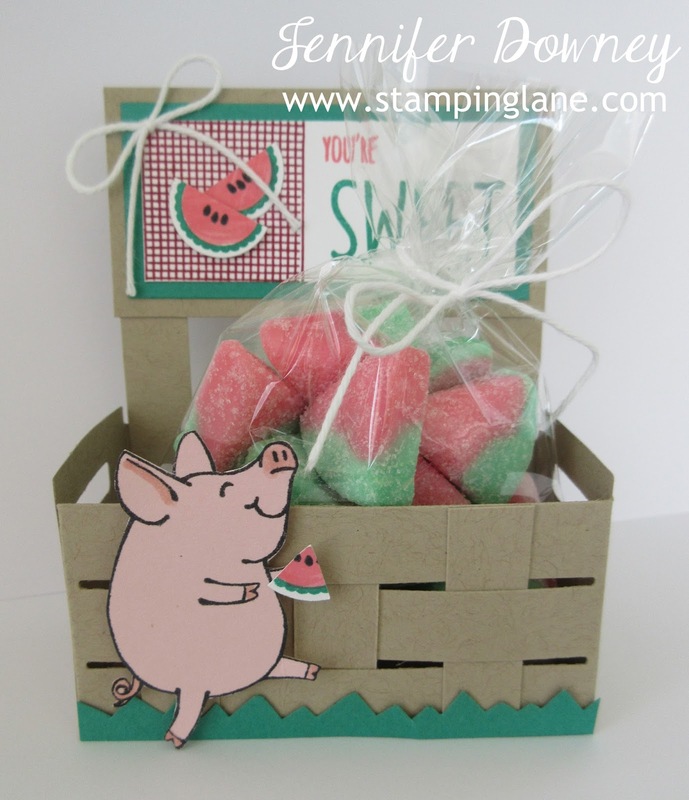 Are you wondering how I made the watermelons slices and red gingham? Look no further than the Tabs For Everything stamp set! The watermelon is the scalloped circle stamped in Emerald Envy ink, then using my Flirty Flamingo marker I filled it in and to top it off I stamped the little birthday candles in Basic Black ink. I punched it out using the 3/4" circle punch and then cut it in half. I had to make two of these so I could snip off a little from the second one so the piggy could have his own slice. The gingham is the lined stamp in that stamp set as well. Stamp it one way then turn it and stamp it the other direction. Voila! You've got gingham! Thanks for stopping by today and going to the fair with me! After all, that's what we here in Maryland do in August. Feel free to keep hopping along to see what everyone else is celebrating this month. Happy Stamping! Yes, these are stinkin' cute!!! I love your watermelons. I really miss the county fairs I loved growing up in Kansas. Not from a farm family, but I loved going through the livestock buildings. Wow, they are really cute indeed! 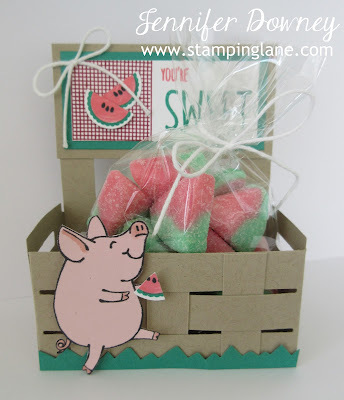 Fun candy and cute watemerlons on your project! Really nice idea for a fair!